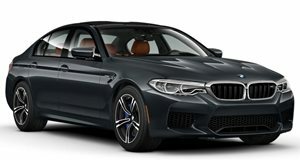 BMW gets ready for Pebble Beach this weekend by confirming the latest 5-Series sedan will in fact receive a diesel model from the M performance division. BMW has just confirmed that the 5-Series will in fact be receiving a diesel model tuned by the Bavarian automaker&apos;s M performance division. However, the highly anticipated M-tuned 5-Series diesel model will most likely not be badged as an M5. Instead, it will have a name similar to that of the 1 Series M Coupe (5-Series M-tuned Diesel, 550dM, 550dXM?) And due to the exptec high torque output, the new diesel 5-Series is almost certain to be offered exclusively with all-wheel-drive. According to TheDetroitBureau.com, power is likely to come from the current 3.0-liter diesel, which will be heavily modified with a unique cylinder head and a single, small turbo. All told, it could deliver up to 500hp and 650 lb-ft of torque. The gasoline-powered M5, by comparison, has 560hp and 502 lb-ft. The modified torque-happy engine will also have a pair of larger twin-scroll units to increase power at speed. It is also expected to make its way into high-performance diesel versions of the X5 and X6 crossovers. So will the new 5-Series diesel make it stateside? BMW hasn&apos;t confirmed this yet, but we&apos;re willing to bet that it will be happening.